For me the conceptual lodestar of rotating masts has been to imagine the wire from the shrouds and forestay morphing into strands at the mast that then spread out onto the mast. When multis started using tripod rigs and rotating masts it profoundly improved performance and ease of sail handling. Mega roachy mains were now possible without some of the crazy workarounds that we saw in the 80s such as dropping the main down for every tack or jibe, or massive double running backstays and type A runner apes. The earliest rotating hounds that I know of were Gougeon designs. They consisted of a chunk of aluminum, a beak, bolted inside of the mast. They were fixed. I used this system in my extrusion mast on my 31’ tri Smoholla and it worked very well. I could get 110 degrees of rotation each side of centerline. 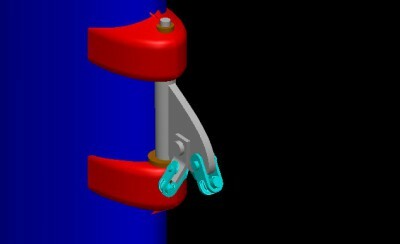 The rotation was provided by a toggle between the rig plate and the beak, and another at the wire terminal. Rotation was allowed by the slop between these. My boat was less than 35 feet long and not used everyday. We found that the charter cats that went out every day were wearing through the aluminum beaks pretty quickly. The next step was to move to stainless steel beaks and to get them to rotate instead of being fixed. On the boats under 45 feet or so that worked pretty well. The bigger boats had two problems. First, the main toggle that holds the rigging plate to the mast took a lot of abuse. Standard stainless ones wore out very quickly. We had to go to high strength stainless. Next, on the big boats, the whole assembly was getting heavier, and starting to cost as much as a Subaru. Especially the fixed part base became crazy to build. Imagine taking a half inch thick piece of stainless and bending it to fit the curve of the mast. Then welding the ears on and drilling dozens of holes for fasteners. I have seen some solutions where the rotating beak and its base are pushed through the front of the mast. The base is then fastened to the mast. That does reduce the large bolted plate, but I worry that the leverage of the base is so much smaller; like 20 times smaller, that the fastener holes elongate and fail. Also, the rotator base parts must be cantilevered out that much farther. Up top there, every millimeter counts, as I see it. About the same time, people started building composite chainplates. I decided to try them on composite masts. They worked great and were relatively easy to do and at very low cost. They made especially good sense to do it your selfers. Next I decided to try composite hound bases on aluminum masts. Of course I was worried about the bond between the composite and the aluminum. The technique of an acid wash and alodyne, plus coating the contact area with epoxy and sanding it seems to work. The wet epoxy blocks the oxygen from getting to the aluminum, and the sanding exposes new, unoxidized surface. Additionally, the very large contact area and the wrap-around shape ensure that the composite hound base cannot move. To solve the problem of three wires coming into a single beak, the Gougeon masts had used a rhomboid stainless steel plate that we called the batwing. Each shroud side of it was bent back to fairlead to that shroud. Again on multis under 40 feet or so, it worked well and lasted a long time. The big boats wore through not the batwing, but the master toggle between the batwing and the rotating beak. I had been insisting on high strength toggles such as Reikman or other 17-5 stainless ones. A client of mine, Geoff Strange (had a 60’ tri and is building 49’ cat now) came up with a very simple solution. No more batwing. The beak does have to be a bit larger. My friend and competitor Roger Hatfield has probably built as many rotating masts as anybody. The last time I talked to him, he had dialed back the rotation on his workboats. He used to use an enormous galvanized shackle up there that all three wires were loosely toggled to. He has since started using three toggles, one for each of the wires, but with loose shrouds. He says he gets only about 30 degrees rotation each way from centerline now, but he feels the simplicity is so much better. My customers with synthetic rigging do about the same thing as the rigging has more stretch. I could see a time where the forestay line spreads out onto the mast, like in my original imagining, and is epoxied onto the mast; all as one piece. I’ve been around people that design and build with some of these steels. I do not claim knowledge or experience. Due to a family illness my boat building plans have been put on hold. Thanks for this discussion. I’m well along building my 60 foot cat, and planning to build a rotating wing mast. The picture you show of Geoff Strange’s design is what I was planning but then I saw a big new cat in the Med this year and studied the shroud attachment through binoculars. It seemed to use just a short flexible woven strap to join the stay to the mast. I am planning to use Dyneema for the stays, this leads to an even simpler solution: make a composite hook or eye on each side of the mast, loop the windward shroud over the lee side hook, and the lee shroud over the hook on the windward side. This means when the windward shroud gets tighter it will rotate the mast – equilibrium will be reached when the torque from forestay tension opposes the windward shroud torque.